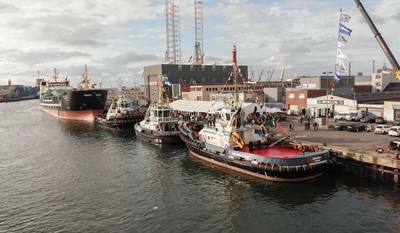 Two of Iskes Towage’s vessels, the Damen ASD Tugs 3212 Mars and Mercurius, have been officially named at a ceremony held at IJmuiden Port, Amsterdam. The naming formed part of an event held to mark the 50th anniversary of the founding of Iskes Towage & Salvage, which was formed by Ben Iskes, the father of current owner Jim Iskes, in 1968. The Mars was named by Elisabeth Post, Deputy for Transport and Traffic for the Province of North Holland, and the Mercurius by Miss Annick Vergouwen, daughter of managing director Ronald Vergouwen. The celebrations were also attended by Iskes staff, clients and many other associates who have worked alongside the company over the years. A third tug, from another yard, was officially named Telstar at the same time. The Mars and Mercurius are among the most powerful vessels in the Iskes fleet and operate mainly in the ports of IJmuiden (Amsterdam) and Europort (Rotterdam), but also are available for assignments further offshore in the North Sea. With 82.5 tonnes of bollard pull the ASD Tugs 3212 can handle the largest vessels that visit the ports and feature a number of typical Iskes modifications.